Welcome, Tomato Pie Fans! I’m taking a hiatus from blogging to finish the sequel to DON’T YOU FORGET ABOUT ME. Meanwhile, I have a series of guest bloggers taking care of the place. Let’s hear from today’s guest, Allison Gingras. What a promise – I am not sure which intrigued me more when I first read it? How one delights themselves in the Lord or what desire I would want fulfilled. The first part was easier than I thought to accomplish because the Catholic faith is so rich in ways to encounter Christ in our everyday life. I could not imagine my life not filled with prayer, the Scriptures and the Sacraments. St. Paul exhorted us to pray without ceasing, so whether folding laundry, driving the car or reading a book, I do everything with a prayerful heart. I will say a Hail Mary for each member of my family as I put their dishes into the dishwasher, say the rosary on my way to an event, or give thanks for the author’s talent as I read their book. My introduction to scripture, only 10 years ago, has transformed my faith life, providing me this amazing gift of learning how Jesus spoke, and therefore having a better sense of His voice in my life. Scripture good for all teaching and reproof has become the center of my faith and my hope, not a day goes by I don’t take a moment to ponder a verse or two. It was also important for me to memorize a few special verses to embrace on tough days when I need encouragement, particularly helpful when writer’s block strikes or my teenage son is teetering on that last nerve! Lastly, the Sacraments are where I go to dip into God’s well-spring of grace. Grace is that undeserved yet freely given gift of God’s Holy Spirit within us (that is the simplified “Allison abridged” version of grace – by the way). When I am feeling distant or discouraged, the remedy is always found in participation in the sacraments – particularly for me daily Mass, time spent in Adoration or making a really good confession. Gifts are best when they are used, and I try my best not to waste the grace present, promised and abundant, in the Sacraments! So, what about the desires of our heart? How do we discover those? That is where God is the most generous – since He has given us our brains (and even our heart’s desires), He is well aware of them. He knows them long before we, so focusing on delighting in the Lord is truly all we need to concern ourselves with. Last September, I received a phone call inviting me to host my own radio show. Reluctant but curious, I asked for a few days to pray about my answer. Off to Eucharistic Adoration I went with a notebook and pen. I sat before Jesus and asked for inspiration – if I said yes, what on earth would the show be about? As I sat pondering, the Holy Spirit reminded me that I had a degree in English, a passion for books (especially Catholic books), and had lead book/Bible study for nearly 10 years – that was to be the foundation of my show. From that time in prayer, A Seeking Heart with Allison Gingras on Real Life Radio was born. Each week, I focus on just one book. Monday-Thursday we discuss the themes, contents and inspirations gleaned from the book and then on Friday, I am blessed to spend an hour with the author. It is not a review show but an on-air book club – it is interactive, interesting, and truly fulfills one of my heart’s desires. I love connecting people and books, especially when I know it will change lives and grow faith. So how do you delight yourself in the Lord, and what desire of your heart can He fulfill? 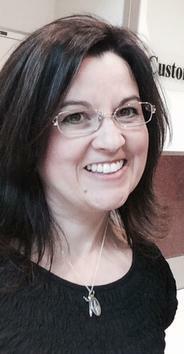 Allison Gingras is founder of Reconciled To You and host of A Seeking Heart on Breadbox Media weekdays 10 am ET. Allison blogs, writes and speaks about living an every life of faith. She created the “Words with” daily devotional App Series: Words with Jesus. and offers presentations on Forgiveness; Trust; and the Blessed Mother. It’s baaaaaack! It’s the What We’re Reading Wednesday linkup over at Jessica’s Housewifespice! I’ve had the distinct honor to be part of the CatholicMom.com Unleashed book club. And guess what book we’re reading! No, seriously! YOU’LL NEVER GUESS! Why, yes, it’s Unleashed by Sonja Corbitt! What’s it about, you ask? Sonja Corbitt was an evangelical Baptist before she converted to Catholicism. In Unleashed, she shares her passion for the scriptures by weaving the Word of God with her own experiences to show readers how the Holy Spirit flows through their lives in relationships, prayer, and even in times of suffering. Sonja Corbitt’s passionate faith and natural storytelling ability combine to create a refreshing message of how God, in his continual pursuit of us, speaks to us through the positive and painful circumstances of life, relationships, and his Word. In Unleashed, Corbitt testifies that prayerful and regular study of the scriptures is the key to hear the voice of God, to see the Holy Spirit at work even in times of suffering, and to receive all the graces God wants to give. Corbitt has been captivating Catholic women across the country with her message about God and his desire to know them in a deep and personal way. Endorsed by her bishop as a “credit to her faith,” Corbitt inspires Catholics everywhere to engage with the scriptures with renewed vigor and energy. First, I have to clarify that Unleashed is not about the charismatic gifts of the Holy Spirit. Rather it is a step-by-step guide for discerning how the Holy Spirit is speaking to us without words but through repeating patterns that not only spring forth from our own hearts but from the hearts of those around us. In this book, Sonja gives us sort of a listening device for making out the guidance of the Holy Spirit more clearly, more thoughtfully, with greater peace and confidence. Do something today. Get to know the Holy Spirit, not as an abstract monstrosity but as a solid, loving friend. Perhaps picking up your copy of Unleashed will be that something you do today. It’s time for What We’re Reading Wednesday, occasionally hosted by Jessica over at Housewifespice. Even if she’s not hosting right now, go on over there and give her blog a cuddle. 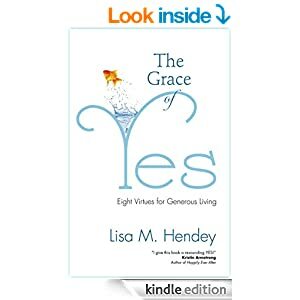 In The Grace of Yes: Eight Virtues for Generous Living, Lisa Hendey gives us a firm but gentle walk down a path out of the fear and selfishness that tends to be the natural human state into a way of living that is made larger and more free by all the ways we can give, and in giving see ourselves as the gifts we are. Each chapter includes a down-to-earth, pointed-to-heaven reflection from Lisa, a set of thought-provoking questions on the virtue being discussed, and prayer. Few writers have the gift of being able to give us a kick in the pants without it hurting like the dickens. Lisa Hendey is one of those who has this gift. If you’d like such a kick in the pants and have others getting kicked along with you (that sounds much worse than it sounded in my head), I also encourage you to participate in the CatholicMom.com Grace of Yes book club going on right now. Say “yes” to The Grace of Yes!